When I sit down and think about all the things I can think about… all the memories… well, it gets a little overwhelming. But when I focus on where we were and what we were doing 25 years ago, there is one particular moment of the ceremony that I remember with such vivid clarity. I wanted to push his glasses up. But those glasses. Those glasses. They were slipping. The priest had us repeating after him and I remember that. I remember Pachelbel’s Cannon in D being played by the string quartet behind us. All lovely, really, but those glasses! My word… they were going to fall off his face. And he looked a little uncomfortable. All I really wanted to do was gently push them back up into place. But I couldn’t let go. Twenty-five years later… the older me looks back at the younger me and wonders, with all I know now, would I take that chance and let go for a second to give a little comfort, show a little tenderness? Is it because I didn’t let go that I’ve learned how to be kinder and more compassionate, to both give and accept love? To know that sometimes you really do just need to hold on? Happy anniversary! And the glasses gave Dave a nice Thomas Dolby look. 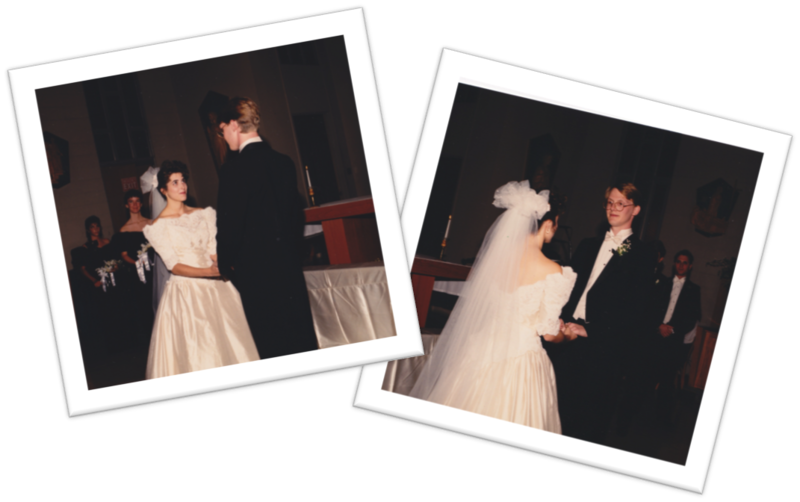 Happy Anniversary, Killens! You are true specimens of love, compassion, humility, grace, endurance, patience, honor, and friendship.